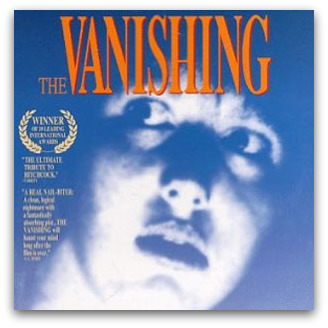 A couple of years ago, in the obscure, unexplained way these things sometimes occur, I was reminded suddenly of Dutch filmmaker George Sluizer's marvellous and scarifying 1988 movie, The Vanishing (Dutch: Spoorloos). A Dutch couple — Rex and Saskia — are driving in France on holiday. When they stop for fuel, Saskia goes to buy drinks and does not return. Increasingly distressed, Rex looks everywhere for her but never sees her again, despite being obsessed by the search ever after. Many years later, he discovers the truth which, of course, not to spoil it for you, I won't reveal. If you decide to hunt for the film with Rex-like obsession, make sure you get Sluizer's original Dutch version and not his greatly inferior English language remake. And don't blame me for the nightmares you may have for some weeks after. The mind has mountains, cliffs and sheer falls, and my imagination had been distracted into precipitate and detailed recall of the film by that one word: vanishing. On that distant day back around 2007, I was contemplating the stretch of dried-out weeds and sun-baked earth which a higher power in our household had earmarked for, some day, a pool. Not just any old pool. A pool with a — vanishing edge. The vanishing-edge pool is also known as the infinity pool or the negative-edge pool. To quote from one commercial description: 'The names refer to the effect of blending pool water seamlessly into the horizon without the visible intrusion of a wall.' And it looks terrific. The absence of a wall creates a stunning effect of space and distance as sky and surface merge. In no time at all, when this wonder was explained to me, I saw in my imagination's eye the pool surrounded with paving, and a sturdy but elegant fence for the safety of the grandchildren, and shade at one end from the surrounding lemon-scented gums and, of course, the illimitable, long and level reaches of the blue water. 'Without the visible intrusion of a wall', however, water simply tumbles quietly over the infinite edge. This means it has to be collected down below and pumped back up into the pool which, like a duck swimming, remains serene on top while furious and ceaseless activity is roiling away underneath. For all this to happen — especially the pumping part — serious equipment is required and it is for this reason that 'infinite' has an even more apposite meaning. It accurately refers to the cost. This, we saw as our researches proceeded, was the actual 'negative edge'. Still, it might all have remained in reach of optimistic possibility had it not been for another species of vanishing. The Global Financial Crisis rolling in with its variable and quixotic temperature tantrums — red hot interest rates, freezing of funds — threatened to make freelancers like us an endangered species. Funds vanished or were buried in icy vaults beyond our puzzled reach. Talk about merging seamlessly with the horizon. That's what the infinity pool plans did — and were never seen again. You know how when you become aware of something it seems to bob up everywhere. Well, from that admittedly rather self-indulgent moment (infinity pools, vanishing edges — really!) there seemed to be more vanishing taking place than was ever dreamed of in George Sluizer's philosophy. No sooner was Kevin Rudd elected than the GFC looked like wiping out his bank account. Meeting this challenge with an effectiveness scarcely equalled by any other major economy, he was then accused of being the architect of another vanishing: 'We'll all be rooned', moaned Barnaby 'Hanrahan' Joyce contemplating emptying national coffers. Meanwhile, leaders of the opposition vanished serially, as if snatched and entombed; Kevin Rudd routinely merged seamlessly with the horizon; Martin Hamilton-Smith, Malcolm Turnbull and Godwin Gretch all fell for the old vanishing email trick; the Murray threatened to disappear; the Coorong went missing along with several Himalayan glaciers, although the latter returned once Family First's Senator Steve Fielding got on the case. Using graphs based on Channel 9's Snicko, Senator Fielding proved that climate change had been going on for millions of years. Senator Penny Wong agreed but suggested it had been going on differently as could be demonstrated by using not Snicko but Hot Spot. Not familiar with TV cricket terms and technology, Senator Fielding announced he was between a hard place and a hot rock and, anyway, when he said 'Snicko' he actually meant El Niño. So there. The debate petered out and, you've guessed it, vanished when Tony Abbott incautiously declared it was all 'crap'. Re-thinking, he amended crap to tax — it was just a big tax. This proposition merged seamlessly with the climatically ambiguous horizon and, without the intrusion of a wall, went right over the edge and out of sight. Well, for now anyway. I like Brian Matthews style. I've not really understood the turbulence of the Undertoad lurking beneath the somnolence of public affairs in this past couple of years, until reading your explication. Brian, it was a big tax before the crap arrived. Are we to accept that the inspiration of sporting victory is alone sufficient to solve conflict and soothe the way to redemption and rebirth for a divided nation? If so, it must be said that Eastwood's film is history rendered as a fairytale. From a patronising priest to a pair of impressionable hippies, the white characters are all doofuses. Bran Nue Dae provides a means for introducing young people to the ongoing impacts of white settlement upon Indigenous Australians.